For a long time, the saying "Nhat Thanh, Nhi Lo, Tam Than, Tu Tac" was deeply ingrained in the subconscious of every Northwestern people with the meaning of ranking the vast order of these Northwest fields. Compared with Muong Lo and Yen Bai fields; Muong Than, Lai Chau, Muong Tac, Son La, Muong Thanh and Dien Bien fields are considered the largest. Muong Thanh field formerly belonged to Dien Bien district, Lai Chau province, with a length of about 23 km, an average width of about 7 km. Located in the middle of Dien Bien basin, Muong Thanh field is like a large "treasure" of rice. If you go to Muong Thanh field, you should go in September because this time, the rice in the golden nine fields makes you overwhelmed by the wild beauty and charm that you can not easily find in urban life. Located in Muong Phang commune, Dien Bien district, Dien Bien province, nearly 20km from Dien Bien Phu city, adjacent to Highway 279, connecting Dien Bien Phu city to the headquarters of Dien Bien Phu - Muong Phang campaign. The population of Pa Khoang tourist area has a total area of 2,400 ha, of which forest area is 1,320 ha, agricultural land is 300 ha, construction land is 150 ha and water surface is 600 ha. Pa Khoang Lake has many rich vegetation, good terrain, good climate suitable for relaxation ... Visitors can travel to Pa Khoang lake in winter or summer. In winter, the fog surrounds the lake, creating a scene that is both dreaming and illusory. In the summer, the lake water is cool and fresh, you can row around the lake in a quiet atmosphere. Is this experience great? Located on Highway 6, part of the pass belongs to Keo Lai commune, Thuan Chau district, Son La province and part of To Tinh commune, Tuan Giao district, Dien Bien province. Pha Din hill or Pha Din slope is a place connecting the border between Son La and Dien Bien provinces. The name of Pha Din Pass originated from the Thai language, Pha Din, in which Pha means "heaven", Đin is "land" meaning the place is the place between heaven and earth. Pha Din is known as one of the "four great passes" in the Northwest, next to the pass of O Quy Ho, Khau Pha and Ma Pi Len. Only when you touch the foot of Pha Din pass will you be able to understand what is one of the "big four peaks". The grandiose and majestic features are quite dangerous, but not everyone can conquer, making Pha Din attract more "phượt" people. Although Din's phase is so majestic, it still bears the inherent poetic nature. To some parts of Pha Din Pass, there will be fog covering, gently and floating like the place of "the first sight" in the northwestern mountain forest. From Pha Din Pass, visitors can see the peaceful and quiet scenery of the villages in the valley. It seems that the landscape gradually becomes peaceful, helping visitors feel extraordinarily comfortable. Located in the majestic natural scenery of the forest area of ​​Tua Chua and Dien Bien. Xa Nhue Cave is located at the foot of a high cliff, standing about 1km from the center of Sang Nhoi commune. The cave is located at an altitude of over 1,500m above the sea level, the cave entrance is 5m wide, about 18m high. Dong Xa Nha has many characteristics to attract tourists to visit and travel. Xa Nhe cave is divided into 5 compartments, each with its own mysterious beauty. The ceiling is shaped like a arch, on the ceiling, there are stone stalactites glistening with different lines, soft and flexible, at times hard and sharp. Each block of stalactites when a flash of light suddenly flashed through, suddenly gleamed and fanciful. 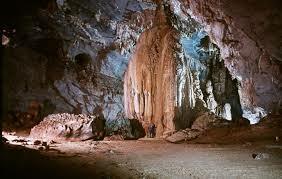 Xa Nhue Cave is also a place that tourists should visit at Dien Bien trip. 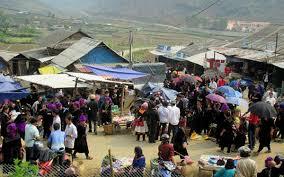 Ta Sing Thang market is a cultural feature of ethnic minority people in Tua Chua. Located right in the central valley of 5 communes: Sin Chai, Ta Sin Thang, Lao Son Phinh, Trung Thu, Sinh Phinh, Ta Sin Thang market is a lively and lively image of the mountain. 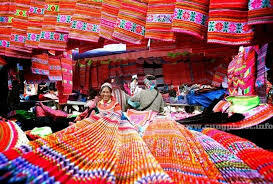 Coming to Ta Sin Thang market, visitors will admire the harmony between the Northwestern mountains and the people here. The colorful market is like the touches on the picture of majestic mountains, white clouds floating, unspoiled and strange. A rather special thing that is not every market is at Ta Si Thang market, trading is natural, fun, rarely bargaining or competing with each other. People who buy goods are only interested in quality and hobbies, so even if they cost a little more, it's okay, and the seller never says the price is too high. So it's easy for a tourist to shop, right? With beauty imprinted as Muong Thanh field, the wild beauty and mystery of Xa Nhue or the intertwined beauty of each other at the highland market. The beauty that visitors can only feel when traveling to Dien Bien. Dien Bien - where you can find beautiful, idyllic beauty! Ta Sing Thang Market Deo Pha Din Lake Pa Khoang Dong Xa Nhe Muong Thanh Field.